Francis Thorne’s music was not performed professionally until he was 40 years old. He had been, respectively, Naval officer, banker, stockbroker, and jazz pianist. Although he had two years of study with Paul Hindemith at Yale, Hindemith discouraged a composing career. It wasn’t until he had private studies with David Diamond in Florence, Italy, that he developed the craftsmanship and confidence to pursue a professional composing career. Thorne’s first orchestral work after completing his studies with Diamond was Elegy for Orchestra. 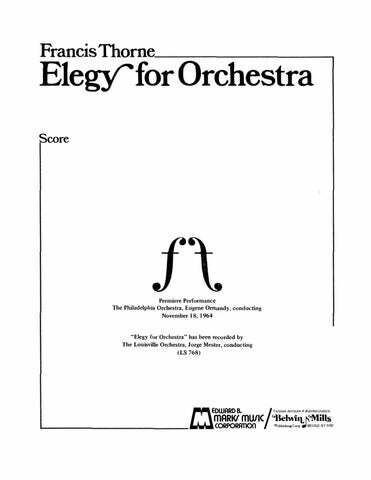 When Eugene Ormandy premiered it with the Philadelphia Orchestra in 1964, the Philadelphia Bulletin described it as “deeply felt and effective.” The success of Elegy brought Thorne back from Florence to New York, where he combined music administration and composing. His catalogue of works includes seven symphonies, fifteen concerti, four string quartets, and the opera Mario and the Magician. He was Executive Director of the Walter M. Naumberg Foundation and the American Composers Alliance, and was President and CEO of the American Composers Orchestra for many years. He also spent two years as Executive Director of Lyn Austin’s Music Theater Group and, for seven years, he ran the Thorne Music Fund which awarded three-year fellowships to American composers of “mature years and recognized accomplishments.” Recipients of these fellowships included Stefan Wolpe, Ben Weber, Lou Harrison, David Diamond, Jacob Druckman, Lucia Dlugoszewski, and Henry Brant among others. He served on the Boards of the MacDowell Colony, The Manhattan School of Music, Composers Recordings, Inc., American Music Center, American Brass Quintet, the Group for Contemporary Music, the American Composers Alliance, and the Walter M. Naumberg Foundation. He also served on the music panel of the New York State Council on the Arts. Thorne’s awards include the American Academy of Arts and Letters, three National Endowment for the Arts fellowships, two Ford Foundation Recording Awards, a Fairleigh Dickinson University Award, the ACA Laurel Leaf Award, a BMI Certificate of Excellence for service to American music, and residencies with the Saint Paul Chamber Orchestra, the Cabrillo Festival (three times), Harvard University, Connecticut College, and the New Hampshire Music Festival. He received commissions from, among others, the Seattle Symphony, Buffalo Philharmonic, Brooklyn Philharmonic, Albany Symphony (three times), Youngstown and Shreveport Symphonies, Valerie Bettis Dance Company, New Haven and Springfield Symphonies, Saint Paul Chamber Orchestra, and the Cabrillo Festival as well as numerous chamber ensembles. Other important orchestral performances have been with the Minnesota Orchestra, the Indianapolis Symphony, the Denver Symphony, the Baltimore Symphony, the Kansas City Philharmonic, the New York Pops Orchestra, the Guggenheim Concert Band, and the Westchester Philharmonic. He was elected in 1988 to membership in the American Academy of Arts and Letters, where he has served as Treasurer and Board Member. He also belonged to the American Composers Alliance, American Music Center, and was a member of the Century Association and Broadcast Music, Inc. (BMI). Thorne passed away on March 7, 2017. His music is published by Merion Music (Theodore Presser Company), C.F. Peters, and General Music, and is recorded on New World Records, CRI, Louisville and Serenus. 3:00 0 0 0 0 – 4 3 3 1; 2Perc. for Solo Violoncello and 10 Instruments 19:00 Solo Vcl. ; 1 0 1 1 – 0 1 1 0; 2Perc. Vln. Vla. Cb. Ballet Music for Seven Instruments 30:00 1(Picc.) 0 1(B.Cl.) 1 – 0 1 0 0; Perc. El. Gtr. Vcl. for 13 Players 20:00 0 0 2(B.Cl.) 2(Cbsn.) – 0 2 1 0; 2Perc. Pno.(Cel.) 2Vla. Cb. for Mixed Chorus and Orchestra 17:30 SATB Chorus; 1(Picc.) 1(E.H.) 0 0 – 4 3 3 1; Timp. Perc. Str. “Along the Hudson” 23:00 SATB Chorus; 2 2 2 2 – 4 2 3 1; Timp. Perc. Pno. Hp. Str. 9:00 2 2 2 2 – 4 3 3 1; Timp. 2Perc. Pno. Hp. Str. 23:00 3(Picc.) 3(E.H.) 3(B.Cl.) 3(Cbsn.) – 4 3 3(B.Tbn.) 1; Timp. 3Perc. Pno. Hp. Str. 13:30 2 2 2 2 – 4 2 3 1; Timp. 2Perc. Hp. Str. for String Orchestra 9:00 Str. 10:00 2(Picc.) 2(E.H.) 2 2 – 4 2 3 1; Timp. 2Perc. Hp. Str. 24:00 3(Picc.) 3(E.H.) 3(B.Cl.) 3(Cbsn.) – 4 3 3 1; Timp. 2Perc. Pno. Hp. Str. for Orchestra 19:00 2 2 2 2 – 4 3 3(B.Tbn.) 1; Timp. Perc. Pno. Hp. Str. 23:30 Timp. 5Perc. Pno.(Cel.) Hp. Str. 22:00 3 3(E.H.) 3(B.Cl.) 3(Cbsn.) – 4 3 3 1; 4Perc. Pno. Hp. Str. for Stringed Instruments 17:00 Banjo, Pno. Hp. Str. 23:00 2 2 2 2 – 2 2 2 0; Timp. 2Perc. Pno. Hp. Str. 23:30 Solo Cl. ; 2 2 2 2 – 2 2 0 0; Timp. Perc. Hp. Str. for Flute, Clarinet, Violin, Cello and Chamber Symphony 17:30 Fl. Cl. Vln. Vcl. soli; 0 2 0 2 – 2 2 3 0; Timp. 2Perc. Hp. Str. for Three Trumpets and Orchestra 11:00 3Tpt. soli; 2 2 2 2 – 3 3 3 0; 3Perc. Elec.Gtr. Str. for Soprano and Orchestra 21:00 Solo Sop. ; 2 2 2 2 – 4 2 3(B.Tbn.) 1; Timp. 2Perc. Hp. Str. 21:00 Solo Ob. ; 1(dbl. Picc) 0 1 1 – 1 1 0 0; 1Perc. Hp. Str. 23:30 Solo Pno. ; 2 2 2 2 – 5 2 3 1; 3Perc. Hp. Str. 15:00 2(Picc.) 2(E.H.) 2(B.Cl.) 2(Cbsn.) – 2 2 2 0; Timp. Perc. Pno. Str. for Oboe and Strings 15:00 Ob., Str. for Orchestra with Electric Guitar Obbligato 5:30 2 0 2 0 – 4 2 3 0; Timp. 2Perc. El.Gtr. Str. for Viola, English Horn, Bass Clarinet and Orchestra 23:00 Vla. E.H. B.Cl. Soli; 3(Picc.) 0 0 3(Cbsn.) – 4 2 3(B.Tbn.) 1; Timp. 2Perc. Pno.(dbl. Cel.) Hp. Str. 21:00 Vln. Solo; 2 2 2 2 – 2 2 2 0; Timp. 2Perc. Str. A brisk and impudent work; clever, madcap and witty, with slapstick percussion and rowdy dissonance and voicing. The “Concerto” marvelously achieves the composer’s goal of insuring that the cello is very exposed, being ‘… one of the most beautiful instruments there is.’ The work’s gorgeous opening for cello and harps is developed into a more forceful section using the entire orchestra but never forgetting the lyrical quality of the work. The second movement is a scherzo which makes effective use of pizzicato strings alternating with a serene middle section again with emphasis on the strings. The closing movement has a mournful tinge to it with interesting intertwining of strings and winds. The work is attractive for its grace, grandeur and lucidity. The piece is big in scope, powerful in effect and, unlike many works of its kind, very unified in character. “La Luce Eterna” is full of strong statements of alternatively tough ideas and soaring melody, demandingly yet gracefully written for the voice and glowingly, transparently orchestrated. It’s a model of what such works should be. Mr. Thorne and his librettist, J.D. McClatchy, have deftly transferred the dark and, yes, mesmerizing essence of this story to the operatic stage without losing its subletly and innuendo. Mr. Thorne’s score is full of pungent harmony, fidgety rhythms and teeming counterpoint…the music provides an effective sense of restless motion, like unconscious forces swirling beneath a calm façade. While watching a new opera based on Mario… I felt some inkling of the magician’s power. The music… and the libretto… were so intelligent and coherent that the steadily accumulating evidence of the magician’s abilities left me as uneasy as the members of his onstage audience… It is remarkable to come across a 70-minute opera that has such an immediate impact, particularly when based on a source as sly and ironic as Mann. Thorne’s “Third Concerto” has a certain mystery about it, like Stephen Sondheim’s Follies has, a mysterious melding of classical style and a pop medium, each of the movements a small dramatic vignette. An unusual mixture of arching melodies and dissonant harmonies, combined with traditional musical gestures that sugarcoat the score’s complexities… the concept is a fascinating one. …knock-em-dead American orchestral style — plenty of brass and jazzy drumming keeping things going, but with a harmonic palette at the intersection of Schoenberg and bebop. A quite extensive work in three movements, it possesses a fleeting return to Bartok in the scherzo, with a desolate closing passage that takes up where the late Beethoven left off. The long-lined slow movement is the exquisite heart of Thorne’s four-movement symphony — a noble score that reflects jazz influences in its fast movements and a fascination with Wagnerian chromatic harmonies in its slow movements. This is a muscular work; its initial 5/4 motive, reminiscent of Bartok, is boldly presented… The second movement… is modeled on Mahler’s famousAdagietto from the “Fifth Symphony,” scored for the same ensemble of harp and strings… Thorne’s rising main theme, unhurried harp arpeggios and the use of solo violin passages also recall the work of the great Austrian master… altogether an extremely engaging work. The violin moves with undiverted continuity through its single movement. Its contrasting major sections are connected by skillfully wrought transitions — a handsome, expressive piece.